Every logical formalism gives rise to two fundamental algorithmic problems: model checking and inference. In propositional logic, the model checking problem is polynomial-time solvable, while the inference problem is coNP-complete. In propositional circumscription, however, these problems have higher computational complexity, namely the model checking problem is coNP-complete, while the inference problem is П P 2 -complete. 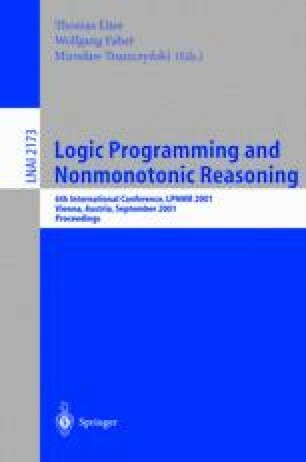 In this paper, we survey recent results on the computational complexity of restricted cases of these problems in the context of Schaefer’s framework of generalized satisfiability problems. These results establish dichotomies in the complexity of the model checking problem and the inference problem for propositional circumscription. Specifically, in each restricted case the model checking problem for propositional circumscription either is coNP-complete or is polynomial-time solvable. Furthermore, in each restricted case the inference problem for propositional circumscription either is П P 2 -complete or is in coNP. These dichotomy theorems yield a complete classification of the “hard” and the “easier” cases of the model checking problem and the inference problem for propositional circumscription. Moreover, they provide efficiently checkable criteria that tell apart the “hard” cases from the “easier” ones. Part of this research was carried out while on sabbatical at the University of California, Santa Cruz. Research partially supported by the Research Commmittee of the University of Patras and by the Computer Technology Institute. Research partially supported by NSF grants CCR-9610257 and CCR-9732041.